Marinate in minutes instead of hours. In a vacuum, marinades penetrate deeper and more quickly, so your favorite recipes can get started in no time. 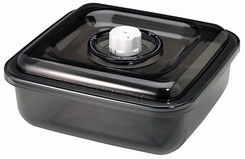 Perfect for the home chef, the 2 1/4 quart square canister can also be used for convenient vacuum storage. The base is microwaveable and dishwasher safe (top rack); the lid should be hand washed with a damp cloth.